Foxtrot Tango! 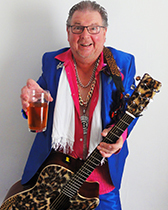 Foxtrot Tango!.....Bill Smarme hosts a cheeky evening of dance inspired Musical Cabaret. A riotous fandango of hip hop, flip flop, lindy hop and new fangled tangos performed by Bill, his swinging band The Bizness and Special Guests. Watch Bill put his left leg in and shake it all about for a truly terpsichoreal experience. Sold out last year so book early to ensure disappointment. Full bar in operation this year.